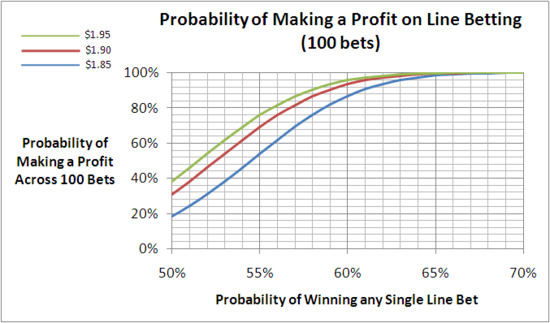 Another brief post tonight, this one on the probability of making a profit on line betting depending on the accuracy of the underlying model used to select the team on which to wager, and on the price obtained for each line bet. The leftmost point on the blue line shows that, if your underlying model has a 50% level of accuracy (ie effectively, it's tossing coins while you're not looking), and if you're only securing $1.85 for each wager, then your chances of finishing ahead after 100 wagers is just under 20%. As your underlying model becomes more accurate you move to the right and become more likely to wind up a winner. Wagering at $1.85, when your underlying model's accuracy reaches about 54% (ie about 1/1.85), you're about an even money chance to make a profit. The price you obtain per wager makes a huge difference to your chances of making a profit. A fairly mediocre model that tips line bets at a rate of 53% is a $2.60 underdog to make a profit across 100 bets at $1.85, but a $1.85 favourite to make a profit across 100 bets at $1.90. Near the 50% accuracy level, regardless of the price you're getting for each wager, small increments in accuracy have a large affect on the likelihood of turning a profit. Roughly, every 1% point increase in accuracy increases the probability of making a profit by 7%. Even a relatively good model is no certainty to turn a profit across 100 bets. When wagering at $1.90 for each line bet - as we do currently - a model with an underlying accuracy of 55% will still make a loss 3 seasons in 10. If you want to be 95% certain of making a profit and you're wagering at $1.90 each time, you'll need a model that has an accuracy of about 61%.